We are considered the number one stockists of discount Samsung CLX-6200ND laser printer toners based in Great Britain. You'll never have to fret about the amount you'll have to spend just to purchase Samsung toners at Cartridge Save. Using us, you'll not need to waste time searching local shops to find the Samsung supplies your printer needs. For the cheapest deals with our industry leading customer service, choose us! Purchasing with Cartridge Save will mean you can save cash and also receive the best customer support currently available. Get comprehensive satisfaction when you purchase replacement Samsung CLX6200ND toner with us because of our company's cast-iron cashback promise, which is standard on everything. In addition, every order comes with absolutely free delivery, almost always delivered the following day! Save some cash, buy right now with us. The Samsung CLX 6200ND is a multifunction printer that can print, scan, or copy and is suitable for a small business or home office that desires colour printing. This laser and colour printer can print in speeds up to 20 pages per minute. The maximum printing resolution that this printer can create is 2,400 x 600 dpi and easily creates extremely clear documents. Additionally, this printer can easily manufacture up to 65,000 pages in a monthly cycle. Copying is done in a resolution of up to 1,200 x 1,200 dpi and can also be done in colour. Scanning is made possible by a flatbed scanner that can produce images in a resolution of up to 600 x 1,200 dpi. The Samsung CLX 6200ND is moderately compact and only takes up dimensions of 46.8 cm in width, 49.8 cm in depth, and 65.1 cm in height. This printer is also very heavy at a weight of 36 kg without paper. The printer connects using either a high-speed USB cord or an Ethernet connection. This printer is also designed with a 170 sheet output tray that comes with a 350 sheet input tray. An optional bypass feeder that holds 100 sheets can also be purchased to handle extra sheets. The Samsung CLX 6200ND printer supports a variety of media which include transparencies, cards, envelopes, labels, and plain paper. Samsung CLX 6200ND toner is available in standard and high-yield versions and can output an estimated 5,000 pages at five per cent coverage. 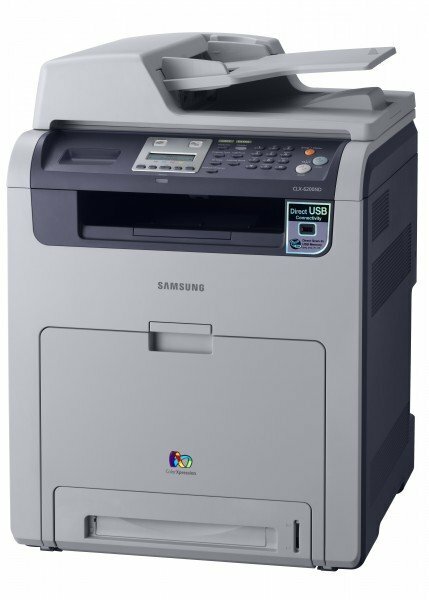 Furthermore, the Samsung CLX 6200ND comes with duplex printing as an option to reduce paper waste while saving money on paper consumption. Currently, it can be integrated with Windows, Linux, and Apple Mac OS X. This printer can also only make up to 99 copies at a time. This may be frustrating for some users who may require more copies and do not want to set up the printer again. It is also limited on which operating systems it can be installed on.